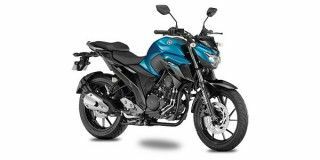 Yamaha FZ 25 price in Pune starts from Rs. 1.19 lakh (Ex-showroom). FZ 25 is available in only 2 variant. The top-end variant Yamaha FZ 25 ABS is priced at Rs. 1.33 lakh. Yamaha FZ 25's top competitors are Yamaha MT 15 (price starting at Rs. 1.36 lakh in Pune) and Yamaha R15 V3 (price starting at Rs. 1.40 lakh in Pune). Q. I am planning to buy FZ 25 ABS is it good bike, how is the maintenance. Is it good for Mumbai city traffic road 20km up and down and how the performance of the bike in rains do it slips?